"For anyone interested in the relationship between politics and mass media, this is a key book. Neil Washbourne combines a compendious knowledge of modern forms of communication with an astute and sophisticated analysis of contemporary politics. Admirable and helpful work for both students and scholars new to the topic. "Professor Liesbet van Zoonen, Erasmus University, RotterdamHow is politics reported in the media?How does the relationship between the media and political organizations affect the political messages that are conveyed?How do members of the public access and make sense of political messages?This book critically analyses the complex relationship between media and politics, beginning with a discussion of what is meant by the mediating of politics. 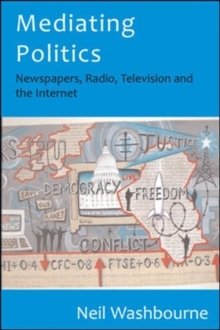 The author outlines the ways in which political messages are formulated, broadcast and received, as well as examining the ways in which the media and political organisations are linked to one another.The author also analyses the relationship between the media and: GlobalisationDe-regulation of the mediaApathy of audiencesIllustrated throughout with case studies from the US, UK and from across the world, the book also explores:Celebrity politiciansHow different national media systems encourage (or discourage) political engagementHow young people engage with the media and politicsHow the Internet has affected the organization of politics and news mediaMediating Politics is key reading for media, communication, cultural and political studies students.